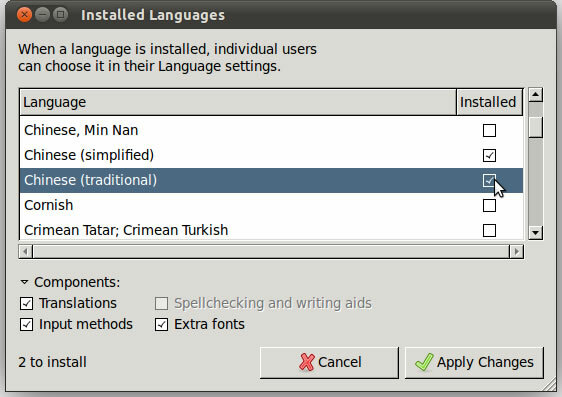 Setting up Chinese input methods in Ubuntu 11 is very similar to Ubuntu 10, except for the location of a few items in the new Unity interface. If Unity will not work on your PC, use my instructions for Ubuntu 10 Chinese setup. But just because the installer says you cannot run Unity does not mean this is permanent! If you cannot run Unity after installation, go ahead and log into the "classic" Gnome interface, and try to install proprietary drivers for your graphics card. 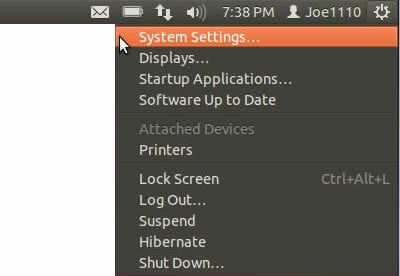 Ubuntu may automatically present this option to you shortly after your first login. Then you should be able to restart and boot into the full Unity experience. It is not necessary to use a fully localized Chinese desktop if you don't want to. Chinese input methods are available in any locale, so you can select "English" or any other language now (but still use Chinese menus later). Either way, you'll find yourself presented with the Language Support panel. 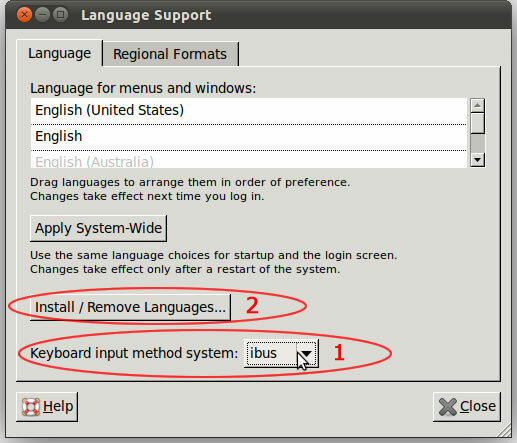 For keyboard input method system, select "ibus". (I will discuss adding other options to this menu like SCIM later.) Then click "Install / Remove Languages...". 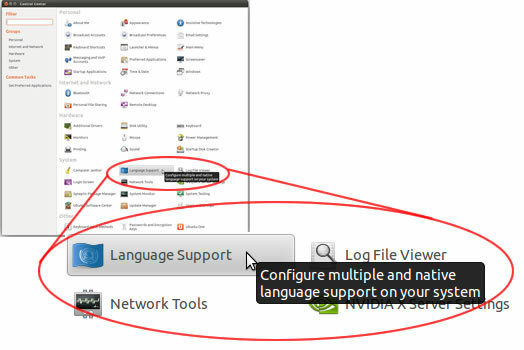 After clicking that button you will see the Installed Languages panel. Click the languages you want to install. The "components" you see here will be automatically selected with Chinese, and usually you want to leave them that way. Then click the "Apply Changes" button. The keyboard icons look different in 11.04 and 11.10 Unity, but they're still keyboards. If it's not there don't worry...IBus does that sometimes. Later you can set the floating language panel to always display, and you will be able to switch input methods using <Alt-Shift> if nothing else. Then logout and login again. You should see the keyboard icon now. As always, feel free to contact me with any questions, comments and suggestions.